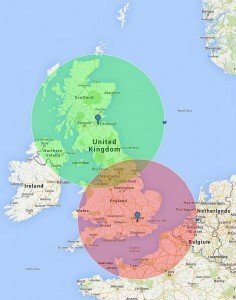 As a rule of thumb, I reckon you can get a rough idea of a country’s foreign policy priorities by drawing a circle around the capital, because this is where the parliamentarians, government ministers and the foreign office staff are based, so the capital is the centre of their universe. 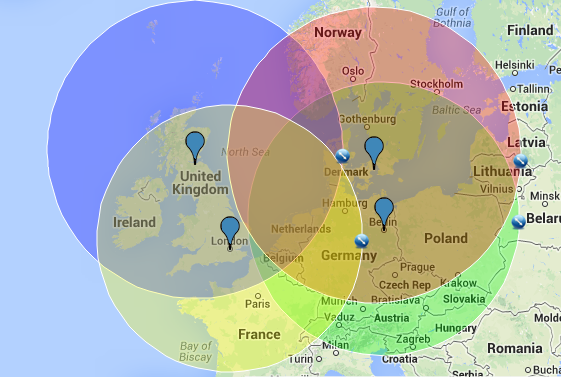 Copenhagen’s circle includes significant parts of Norway, Sweden, Finland, Estonia, Latvia, Lithuania, Poland, the Czech Republic, Germany, Belgium and the Netherlands. This perhaps explains why Denmark fought so hard for the independence of the Baltic countries and for their eventual membership of the EU when most other EU countries didn’t think it was that important. London’s circle takes in most of the British Isles (but not Orkney, Shetland and the Outer Hebrides), France, the Low Countries and Germany, and bits of Denmark and Switzerland, which is probably a reasonable guide to how London-based media view Europe. Berlin’s circle takes in a lot on Central Europe, but the exact details need not concern us here. Perhaps the most interesting thing to do is to look at the difference between Edinburgh and London. Compared to the UK capital, the circle of Scotland’s capital includes all of the Scottish islands, the Faeroes and significant parts of Norway, but excludes large parts of France and Germany. This means we can expect Scotland’s foreign policies to focus much more on Scandinavia and the North Atlantic. 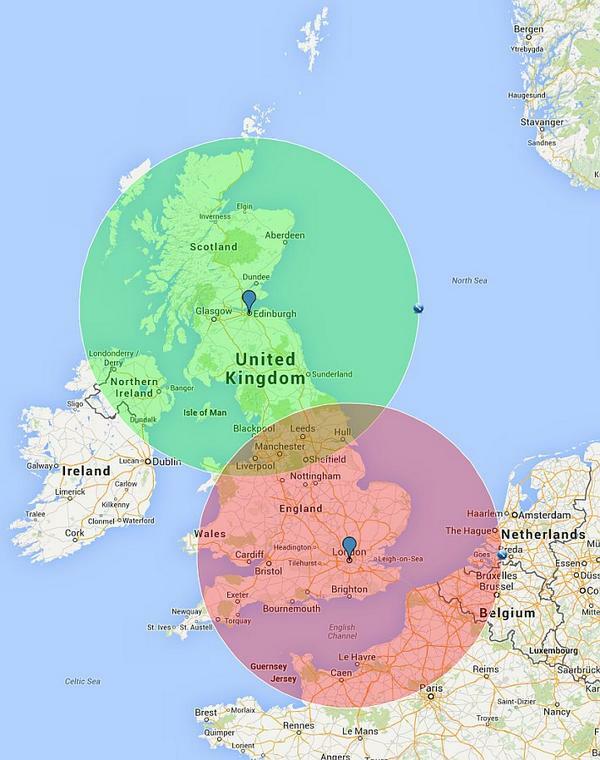 When I posted the map above on Twitter, Statgeek posted a map showing a 200 mile radius for London and Edinburgh (reproduced on the right) as a reply, noting the connexion between this and the HS2 plans and lack of infrastructure in North, as well as the fact that Northern Ireland is included in the Edinburgh circle but not in the London one. If my circle theory is right, we should not expect the rUK’s foreign policy priorities to be significantly different from the UK’s; on the other hand, Scotland’s are likely to revert to the situation before the Union was created. Clever steering away from ‘the exact details’ so soon after 4/8/14 eh! Ah, that ’14! I thought you meant two days ago, not 100 years and two days ago. I’m not sure my circle theory worked that well in the past, btw, when the foreign policies were to a large extent decided by royals who typically had close family running other countries. It’s interesting how Berlin’s instinct to dominate Central Europe is now in harmonious resonance with Poland’s instinctive distrust of Russia. I never thought I’d see that happen. Different from WWII, I tend to think all the great powers were more or less equally at fault for the outbreak of WWI. I disagree … if Germany had decided to stop trying to take France yard by deathly yard, the British boys could have happily gone home. I’m not sure I agree with you on the circle theory with regard to London. London’s foreign policy has always been very much connected with the trade concerns of the City. The reason liberal Tories like Boris Johnson are suddenly writing more Eurosceptic blog articles is because the City wants to focus more on trade with Asia, and wants foreign policy to match. Pre-1989, foreign policy for both London and a hypothetical independent Edinburgh would have been focused on mutual defence against the Warsaw Pact. But now, I can definitely see a divergence between what Edinburgh and London would want to focus on, although foreign policy interests for Edinburgh might extend into regions like Flanders and Catalonia. Thomas Widmann what do you think the foreign policy goals of an independent Edinburgh would be? Sorry to hijack your post!!!! One of the biggest crimes of the Blair era was the delibarate dumbing down of the Foreign Office’s foreign policy advisory groups.